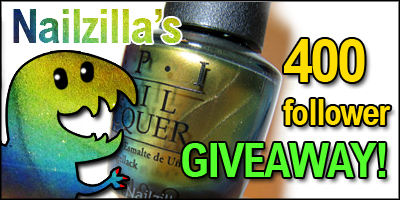 NailZilla: 400 follower giveaway - OPI Just Spotted the Lizard! 400 follower giveaway - OPI Just Spotted the Lizard! Whoa I had to skip ahead to 400 followers just to keep up! I'm finally done taking care of my last 2 giveaways, so time to start it all again.Today for grabs we have this duochrome beauty: OPI Just Spotted the Lizard! From the Spiderman collection, this beautiful polish is green, which shines gold, teal and blue at some angles and is apparently a dead-on dupe of Chanel Peridot. Check out the pictures and the full review over here. This is a BRAND NEW bottle! This giveaway is open internationally, so don't hesitate to enter! Hm, I think it has to be Tacos that is my favorit food. So many favourite foods, well McDonalds for a hangover cure, a mahoosive cooked full english breakfast, krispy kremes, Oh the list is endless!!! I love food, in general. I really can't decide! but i adore ice cream! congrats!! hmm...favorite food...well, I love Italian, seafood, asparagus, and guacamole to name a few. My favorite food is chicken...in all its various forms. Yum yum. My fave food is pizza or fried chicken :) yum! My favourite food would have to be pb&j's.. or bagels. mmmm.. I love carbs lol. Food: CARBS! Lol I love pasta of any kind! Ice Cream. Ben & Jerry's, either Full Vermonty or Half Baked. Even if I don't win it's been worth today's visit just to see that image! lol Keep it up! Local cuisine? Indulge me, I love discovering stranger new foods! Any pasta dish with cheese, mmm. My favorite food is CARBS...and chocolate. french fries. especially mcdonalds when they're nice and soft, OH MY GOSH NOW I'M HUNGRY. You have the best blog name!! I love it. I love sushi and unagi don the best. Nom nom nom! If I had to pick I would say pizza. You can have it so many ways. Chocolate!!! ... if it counts. :) However, I'm really craving pizza right now. a nice fillet steak - mmmmmmmm!! BTW although i have been following you on my rss feed reader, I hadn't used GFC, I just put you up to 500!!!! My favorite food is ice cream! My favorite food is Lasagna!! My favourite food is PIZZA!! French onion soup dumplings at Stanton Social in NYC! I love sushi and sashimi! Gotta go with In N Out! I love Chocolate Mousse Pie! Sushi! Can't wait till I go on holiday to Japan next month to have some delicious goodness! Pizza is my fave food! My favorite foods are sushi and chocolate chip cookies! I'm allergic to milk/butter products, gluten/wheat, and sugar cane but I've perfected the recipe for gluten, sugar, and dairy free cookies and they're amazing! I love pancakes! Thanks for the chance to win! I love salad from crabs! I love all kind 0of salads!!! Hmm favorite food... I love pasta, any kind of pasta. But I love smoked salmon too. Especially on some kaiserbrötchen straight from the oven, still hot. Or chocolate chip cookies... Now I'm hungry! I think Red Velvet Cake is my absolute favorite food! Pizza :) Thanks for the chance!